Stress fractures of the vertebrae (spondylolysisI) are a common spine injury, caused by overuse or hyperextension of the spine. Gymnastics, weight lifting, and football are among the sports prone to this injury. 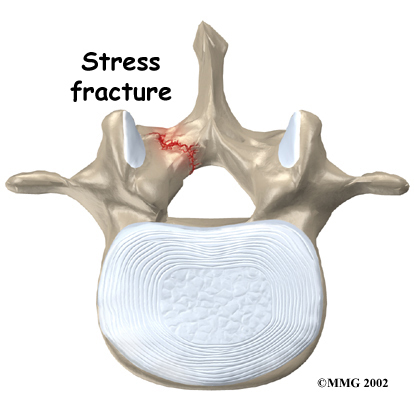 Stress fractures most often occue in the fifth lumbar vertebra and act to weaken the bone, sometimes to the point where the vertebrae shift out of place; this condition is known as spondylolisthesis. The upper and lower joints of the lumbar spine are joined by the pars interarticularis, the weakest bony portion of the vertebral neural arch, and the region between the superior and inferior articular facets. Overuse injuries can result in cracks or fractures in the pars interarticularis, a particularly common occurence in adolescent athletes during sudden growth spurts. The lowest lumbar vertebra (L5), where the spine meets the pelvis, is the most common site for vertebral fractures. Genetic predisposition. Mechanical stress caused by overuse, flexion, twsting, or hyperextension of the lumbar spine. Growth spurts, especially in adolescents. Pain spreading across the lower back. Spasms causing stiffening in the back. Tightening of hamstring muscles, causing changes in posture. If slippage due to vertebral fracturing is ignored, it will worsen and can become incapcitating. Bone that has developed cracks requires sufficient time to rebuild, a process known as remodeling. Surgery may ultimately be required should fractures further develop and become severe. Following a thorough healing period (which may last 6 weeks or longer depending on the severity of the injury), flexibility and strength training exercises should be undertaken, avoiding overuse. Exercising on hard, inflexible surfaces like concrete increases the forces causing stress to the lumbar spine, and should likewise be avoided. 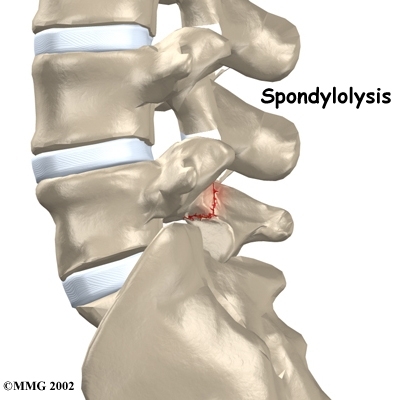 Unlike most stress fractures, spondylolysis (and spondylolisthesis) do not typically heal with time, although given adequate healing time, bone remodeling tends to repair lumbar fractures, particularly in less severe cases. Should rest and normal rehabilitation fail to restore mobility and should long-term pain persist, spinal surgery (in which the lumbar vertebrae are fused with the sacrum) may be necessary. Call (+65) 64712 674 (24 Hour) to fix an appointment to treat Lumbar Stress Fracture today.